Considering we mostly listen to music for pleasure, Brian Eno’s “ambient music” works of the 1970s were a provocation. With slow and somewhat repetitive instrumentals focused on tone over structure, the albums have cemented Eno as a leader in bridging avant-garde movements and pop. But it’s that provocation that intrigues John T. Lysaker, the William R. Kenan Professor of Philosophy and Department Chair at Emory College of Arts and Sciences. Lysaker, whose research explores the nature of art, believes that the album challenges typical approaches to art. In doing so, Lysaker argues in his new book, “Brian Eno’s Ambient 1: Music for Airports,” the album provides a space for deeper thought. Beyond his innovations in ambient music, Eno is also a legendary producer who has worked with David Bowie and Talking Heads among others. Lysaker has listened to Eno’s own work since discovering his music as a teen. It is as a philosopher, though, that Lysaker is led to consider the different kinds of listening that “Music for Airports” requires. Even casual music fans would be familiar with background listening, the sonic accompaniment to other activities, and with performance listening, the focus required at a concert. Lysaker argues Eno’s willingness to use catchy musical phrases in the absence of clear rhythmic structures keeps “Music for Airports” from existing only in the background, while the lack of narrative development keeps it from serving as a showpiece. That leaves avant-garde listening, for sounds outside of traditional configurations of melodies and scales — for sounds such as reverb — and reverie listening, in which the music initiates open-ended reflection. Eno’s album provokes each kind of listening. Although no one can listen in all four ways at once, Eno’s deliberate engagement with each of the four creates that hazy and calm new space. But it also demands more than what German philosopher Theodor Adorno calls regressive listening, what we now think of as those who believe they are fully engaging with music only because it confers some kind of prestige. Lysaker brings a strong theoretical focus to this book, which is part of the Oxford Keynote Series, a series of expert-authored books from Oxford University Press. 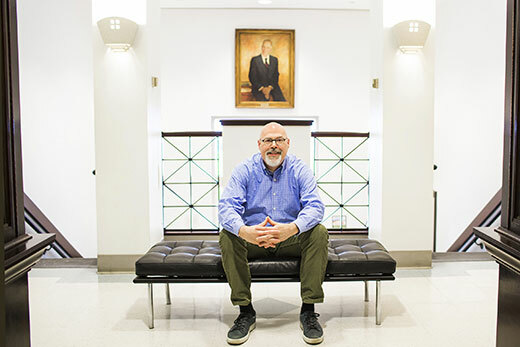 The series aims to connect music studies to the broader world, says Kevin Karnes, series editor and chair of the Emory College music department. The books in the series feature original research into a work from writers who range from ethnomusicologists to music critics to, of course, philosophers. Eight books have been published in the series so far, including Karnes’s study of a piece by Estonian composer Arvo Pärt in 2017. In many ways, the detailed looks at Eno and Pärt show their complementary role in the context of 20th century art music, Karnes says. Eno came from the pop-music world to examine and create from the random processes of avant-garde classical music. Pärt reached from that avant-garde background into Western rock, trying to make his work more accessible.